Little Gabby Gibbons wants nothing more than to show off her monster, Dwight, to the rest of the student body, but her mother will have none of it. So Gabby sneaks the hungry critter to school under the guise of being a new student so he can try out for the school play, A Christmas Carol. If he gets the part, then her mother will have to let Dwight come to school. He does and she does (and it all works out in the end) but not after Dwight tries to eat a few people and hack up gunk on the principal. Outside the main plot there lies another story, the one where Gabby’s dad is always gone, always busy, always missing things important to her. Even he manages to make the play, albeit late, and is the first to clap. 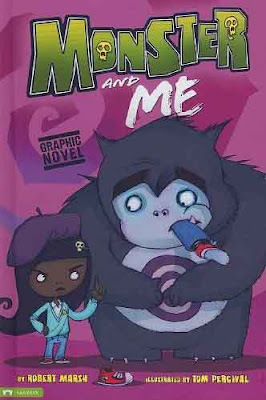 MONSTER AND ME is a breezy read with some nice vocabulary to boot: blubbering, enrolled, equal rights, ghoul, growling, humbug, ovation, self-esteem, showbiz and whine. The books (like all the graphic novels from Stone Arch) sport a glossary with pronunciation guide, discussion questions and writing prompts. It even has a section telling the student how to draw his or her own monster. MONSTER AND ME has a happy ending, one of the kinds with a pretty bow on top, but that doesn’t take away from the fact that our protagonist must deal with real life big kid problems, like an absent father. On that front, the book gives kids hope that there problems might just work out, too. Tom Percival’s art is sketchy, rough, rugged – a compliment to the monster story. It has a 21st century, urban feel and is kid friendly without being childish. It has elements of kid humor. Gabby goes to school with the zipper of her jeans down and a bit of barfing on the part of Dwight the monster. This early reader comic is great for little minds and little hands. The vocabulary offers substance without being overwhelming to the child. The story offers plenty of text-to connection opportunities and chances to talk about responsibility and choices.